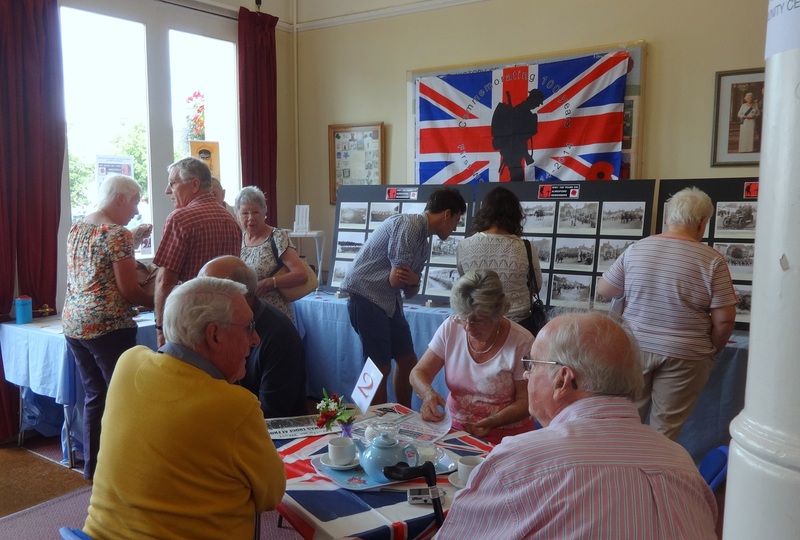 Several hundred visitors to the Alresford Community Centre on August 9th & 10th appreciated an exhibition commemorating the contribution made by Alresford and the surrounding area, for example the Tichborne and Morn Hill camps, during World War 1. The exhibition was organised by the Alresford Community Association Fund Raising Committee. Contributors to the many displays included Alresford Heritage with support from the Alresford Museum Committee, The Alresford Historical & Literary Society, Perins School and the Morn Hill project ‘To Honour a Promise’. Many treasured artifacts and memorabilia were kindly donated for display by local residents. Refreshments were provided by the Community Centre Fund Raising Committee & Volunteers and over the weekend £135 was received in donations which will be given to the Perins School World War 1 ‘Plant a Tree’ project. 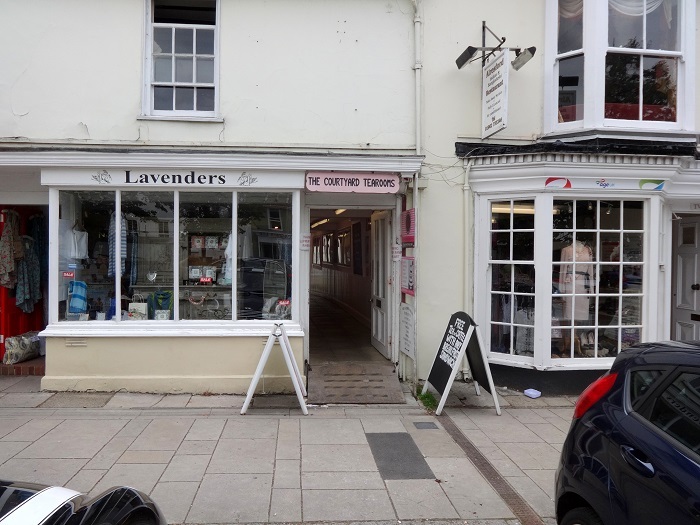 Some of the items and stories shown in the Community Centre over the weekend have been returned to the Alresford Museum display cabinet in Alresford Library in Broad Street, where they will be on show until late September. The five panels showing pictures of local scenes from WW1, created by Gog Andrews of www.alresfordheritage.co.uk, are now on display in the alleyway off Broad Street (between Lavenders and the AgeUK Charity shop) which leads to the Courtyard Tearooms, and will remain there during the autumn. If you have any further pictures which could be copied and added to this record, please contact Alresford Heritage, or Alresford Memories via a comment on this webpage. 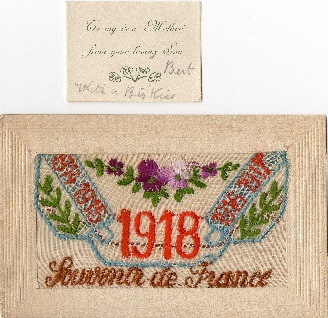 Because its August 4th, here are some further images showing Silks from WW1. These items are still on display in the Alresford Library NATT Museum cabinet. ……from one family, in two World Wars! Valery Hollier is the grand-daughter of Edgar and Alice Teresa Blake. 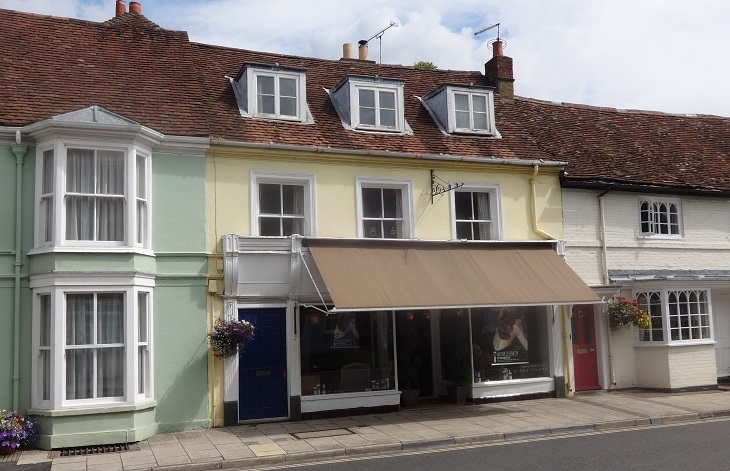 Edgar Blake was the manager of The World Stores in East Street, in Alresford, at number 15, which is now the hairdressers. 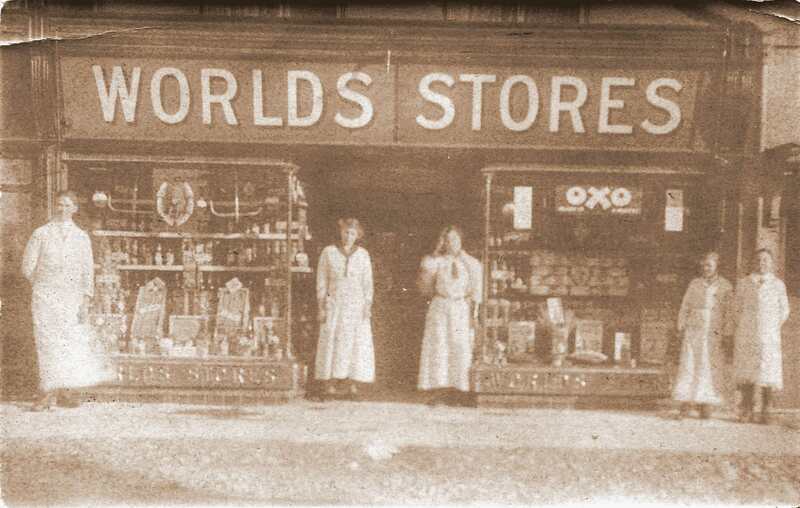 The World Stores (or, looking at the picture, maybe it was called the Worlds Stores) was in East Street from around the 1920s until the 1950s: Pat Bentley and Audrey Chalk remember the World Stores in the 1950s, Pat from his paper round (See Alresford Articles Number 4) – and Audrey worked in the shop for a time. Edgar and Alice had four children, Kenneth, Marjorie, Primrose [Valery’s Mum, known as Peggy] and Barbara. 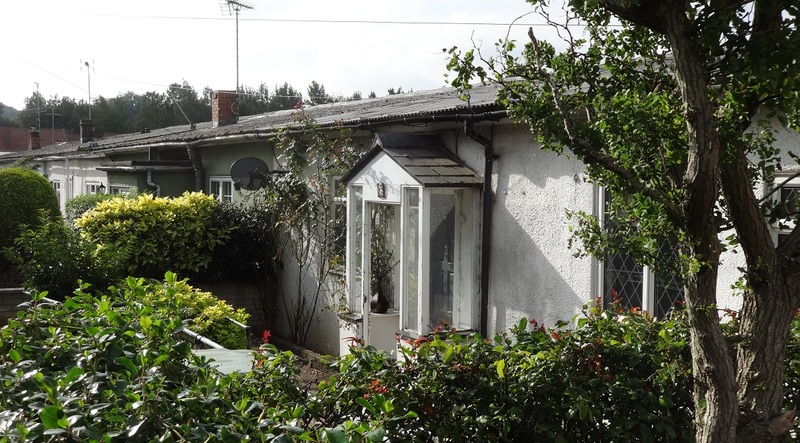 Barbara is still alive, living in Winchester, aged 92, and Valery, born in 1946, lives in Bournemouth, but returns to Alresford to visit whenever she can. In WW1 Edgar Blake was in the Royal Hampshire Regiment, fighting at the Somme. 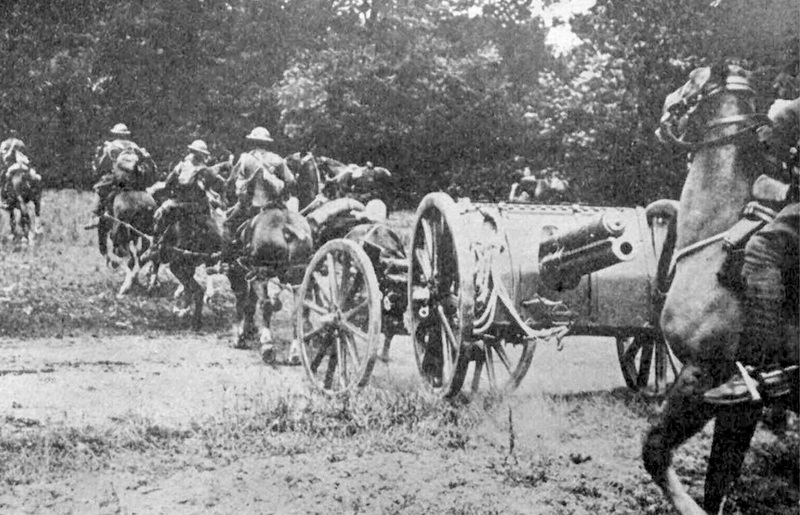 A shell exploded close to him, and it blew half his face away: these very bad injuries led to his comrades leaving him where he lay, believing he would die. The advancing German troops found him and took him back to a field hospital – this led to a series of 22 operations on his face, rebuilding it and using skin grafts from his chest. Valery says that each operation was photographed and written up in German: at the side of each photograph each procedure was described. This album is now to be passed to a museum from one of her cousins in Hertfordshire. During his treatment Edgar heard one of the Doctors say that “This one will not make old bones”, implying a short life expectancy. In this diagnosis they were wrong, in that he lived until March 1977, achieving the age of 89. His face was always disfigured, and he had to eat what Valery calls ‘sloppy food’ – like shepherd’s pie, home-made soups etc. Alice died in 1963, and both of them are interred in St John’s churchyard: in their retirement they lived at 8 Bridge Road. 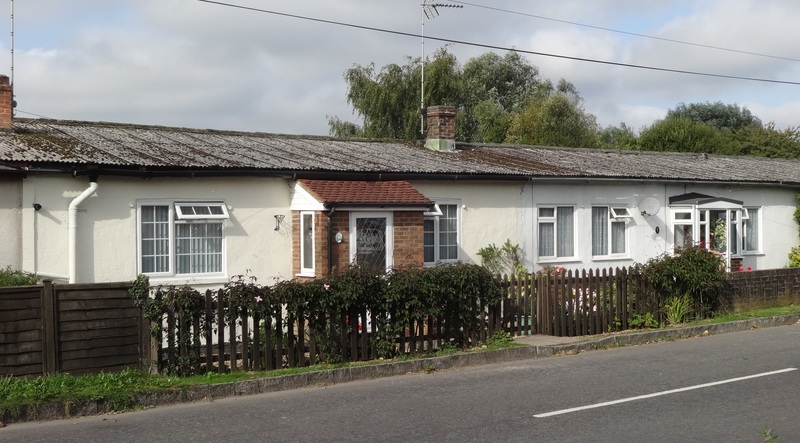 Peggy Blake was living in Alresford at the outbreak of WW2, and was courting Leonard (Len) Reginald Swatton, from Winchester, at the outbreak of WW2: he went off to France with the 51st Highland Division of the Royal Horse Artillery. 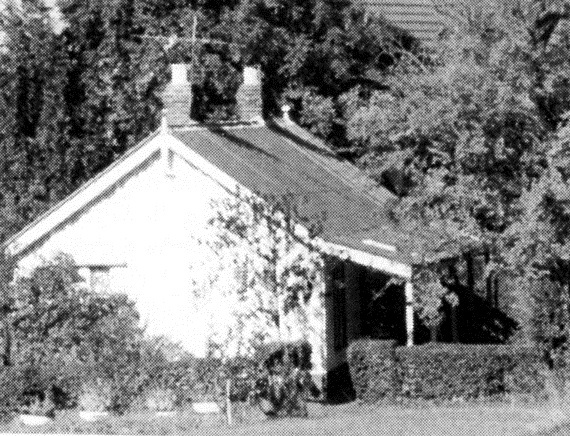 Early in February 1940 Peggy received a telegram saying “See the Vicar , we are getting married!”. With leave from France and a special license they were married, on 14 February 1940 in St John’s Church. Only 3 days later Len went back to Europe via Chideock in Devon: he was captured by the Germans in late May/early June 1940 at St Valery en Caux. Because, despite the events, he liked the name of the place, this is why Valery, who arrived after the war in 1946, was given the name, with the unusual spelling. She was christened by Canon Robertson Len was a POW for five years, held in the Stalag VIIIB camp near Auschwitz in Southern Germany. When he was released in 1945 he told Valery [as a child] that the Germans marched them round and round in circles, but later she discovered this was what was known as The Death March, with prisoners trudging around Germany between January and March 1945. It is ironic that two members of the same family could have had such contrasting treatment as POWs of the Germans in the two wars. But at least both survived the war to come home. Thank you, thank you, SO much for the wonderful “Write up” with regards to my Grandfather and my own Father during World Wars I and II, in your reminiscences. 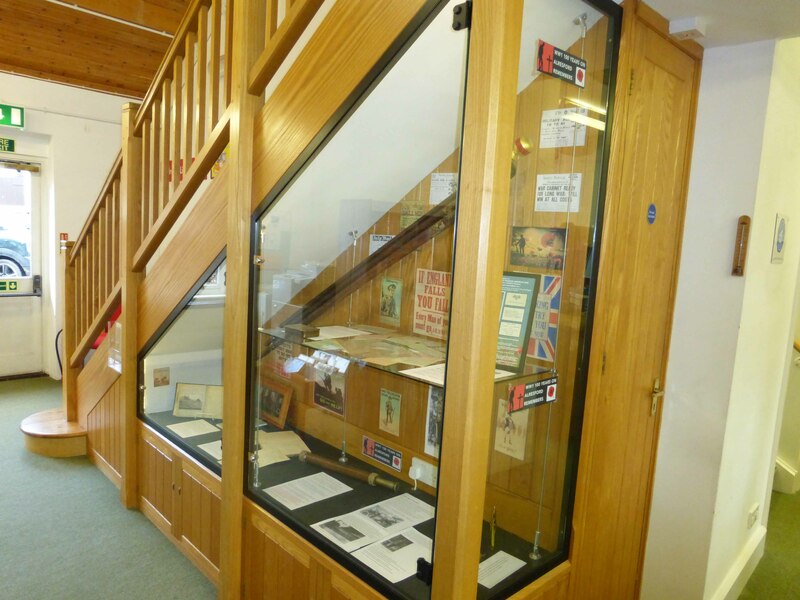 This year we commemorate 100 years since the start of WW1, and there will be a display by the Alresford Museum committee of WW1 memories from us all in the Alresford Library cabinets. The first set of objects will be on display for May and June 2014, and a second set in July/August, and if we have a lot of items, also a third set. What does WW1 mean to you and your family? 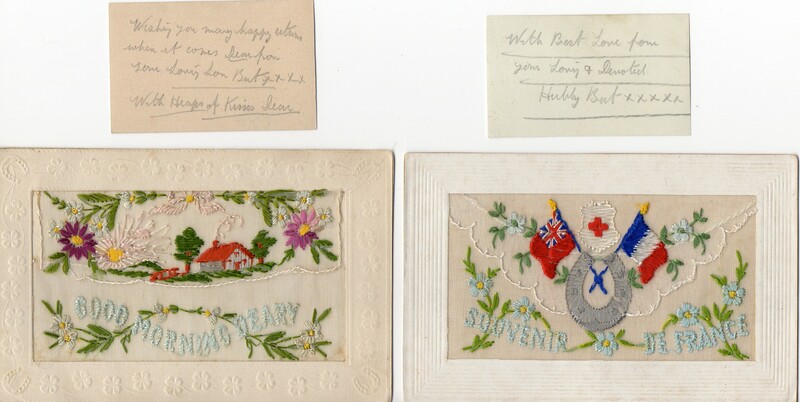 In the display to start in May, as an example, the Museum Committee have collected some items from their family histories relating to WW1: some of these are from my grandfather, who fought in that war. He had no links to Alresford, but the items on display will be relevant to most of that generation of men who went off to fight, whether from Alresford, or in his case from Leeds in Yorkshire. What would you wish to display to remember that time, for your family? Please show us the items, let us put them on display, on loan for a few weeks, with a story about what they meant at the time, and what they now mean to you. 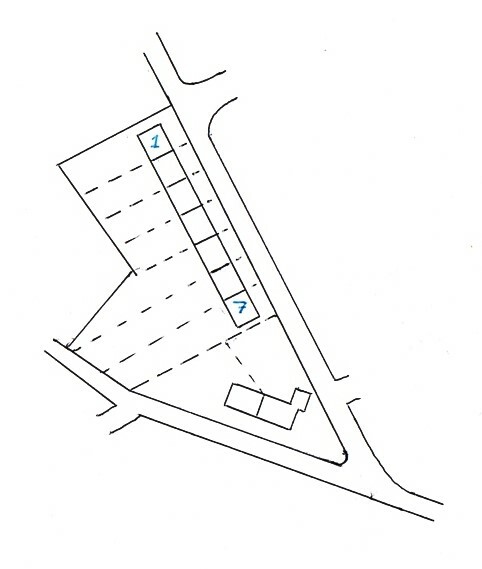 Contact us through the NATT website, www.towntrust.org.uk, or via Nick Denbow on phone 734824 or nick@nickdenbow.com. 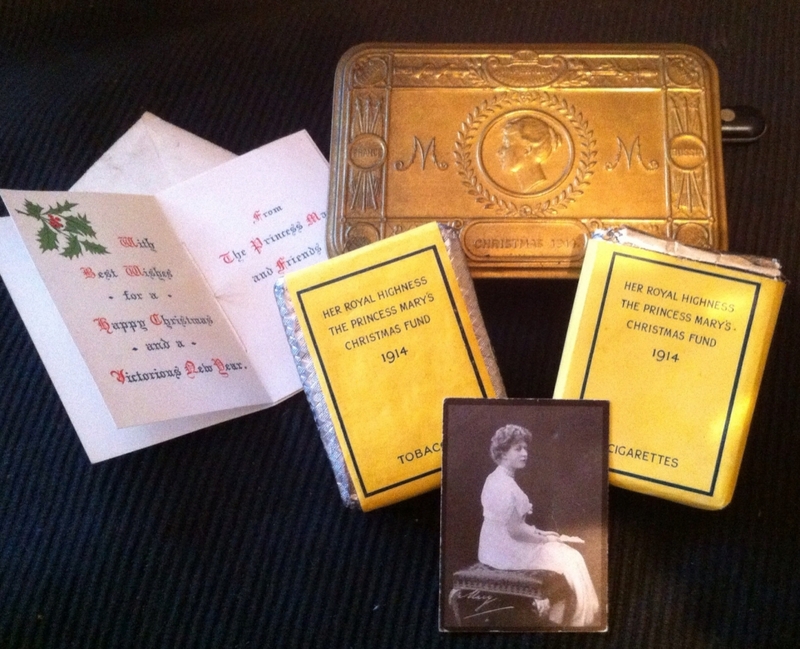 This Christmas presentation box was sent to every soldier fighting in Christmas 1914, ie the first Christmas in the war, by Princess Mary, the seventeen year old daughter of King George V and Queen Mary. The purpose was to provide everyone wearing the King’s uniform and serving overseas on Christmas Day 1914 with a ‘Gift from the Nation’. The contents of the box varied considerably; officers and men on active service afloat or at the front received a box containing a combination of pipe, lighter, 1 oz of tobacco and twenty cigarettes in distinctive yellow monogrammed wrappers. Non-smokers and boys received a bullet pencil and a packet of sweets instead. Indian troops often got sweets and spices, and nurses were treated to chocolate. Many of these items were despatched separately from the tins themselves, as once the standard issue of tobacco and cigarettes was placed in the tin there was little room for much else apart from the greetings card. The soldiers in WW1 were expressly forbidden to keep diaries of their time at the front, or anywhere else, as these would have been invaluable to the enemy, if they had been captured, in knowing troop movements and routes, amongst other things. However, a lot of soldiers wrote such diaries, even if only after the war, in order to get the memory out of their minds. My grandfather was one of the latter, and he had many months to do this, recovering from malaria in a UK convalescent hospital, after fighting in East Africa (Tanganyika) with the Royal Engineers. 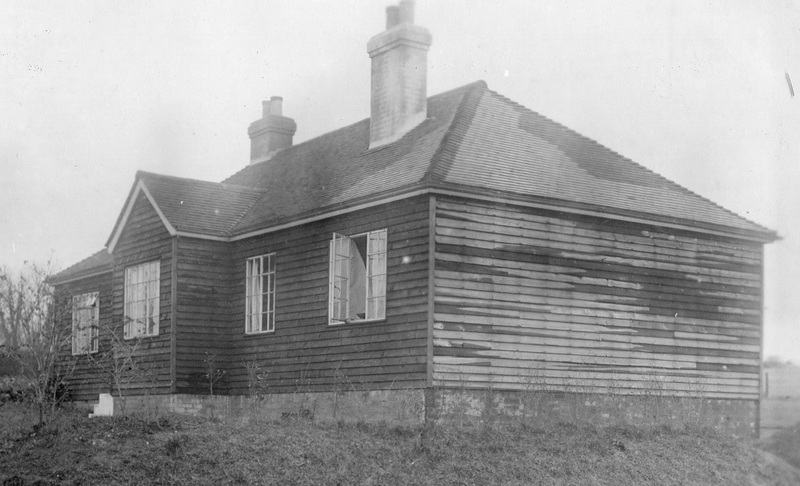 Much of the text of the diary section of his record is already re-published on the website www.dockraydiary.wordpress.com . The diary and his medals will be on display in the library cabinet. Other diaries and memoirs are on show, one as reported in the previous story on this website. 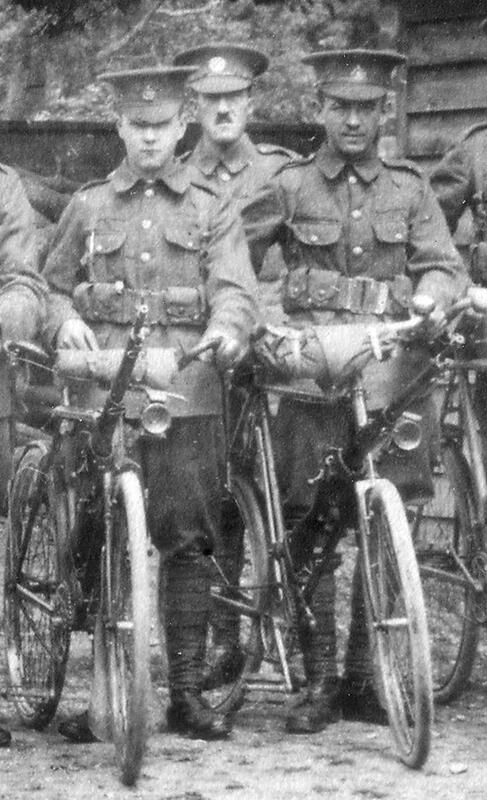 Prior to the Great War, John Triggs of West Meon joined the Hampshire Cycle Regiment, and then volunteered for the Hampshire Regiment after the outbreak of war. He fought at the battle of the Somme in Summer 1916, and was killed in the October of that year. His story is given separately on the www.alresfordmemories.wordpress.com website, and this page will be shown in the library. Look-out posts, or scouts, were the primary methods of obtaining military intelligence about enemy intentions in WW1. Most scouts were issued with a telescope, to enable them to see the approaching enemy, observe troop movements or aircraft, or to identify where the cannon fire was landing to advise the artillery to move their aim up or down, right or left. 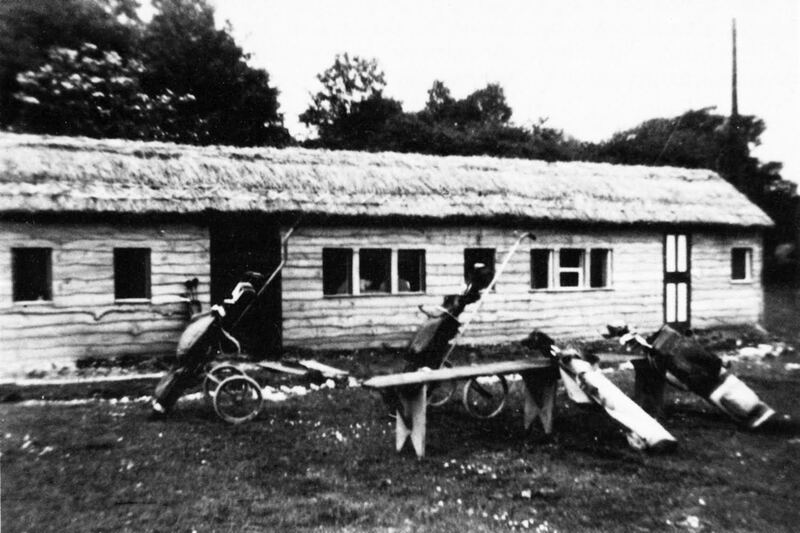 Many of these scouts were hoisted up on barrage balloon type platforms, to better see over the enemy lines. Other “Officer of the Watch” telescopes were developed for the Royal Navy. These were made by Dollond, BCC (Broadhurst Clarkson Company), N+Z (Negretti & Zambra), Troughton & Simms, Ross, and others. On display currently is an “Officer of the Watch” telescope that saw service off the Belgian coast, with its owner, Captain Haselfoot of the Royal Navy. In later years Capt Haselfoot was famous for sighting a “Sea Serpent” with a long swan like neck, in the North Sea – rather like what we imagined that the Loch Ness monster looked like. 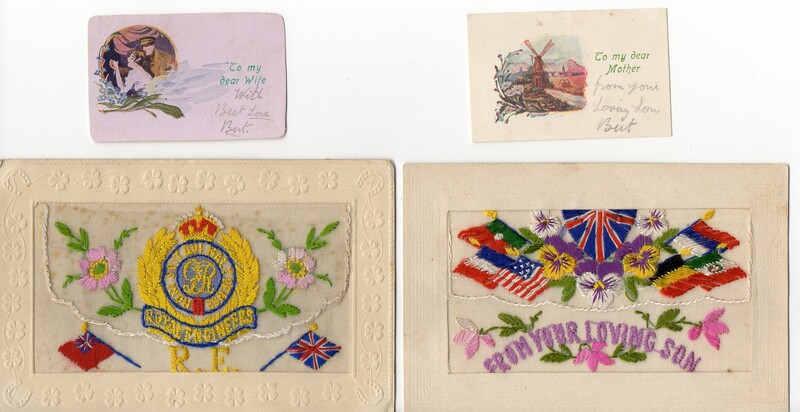 Send us your memories, or loan us your Grandad’s or Great-Grandad’s souvenirs, or his medals, with a brief explanation about what they are and who he was, where he fought etc, and we will be delighted to display them and record them on line. 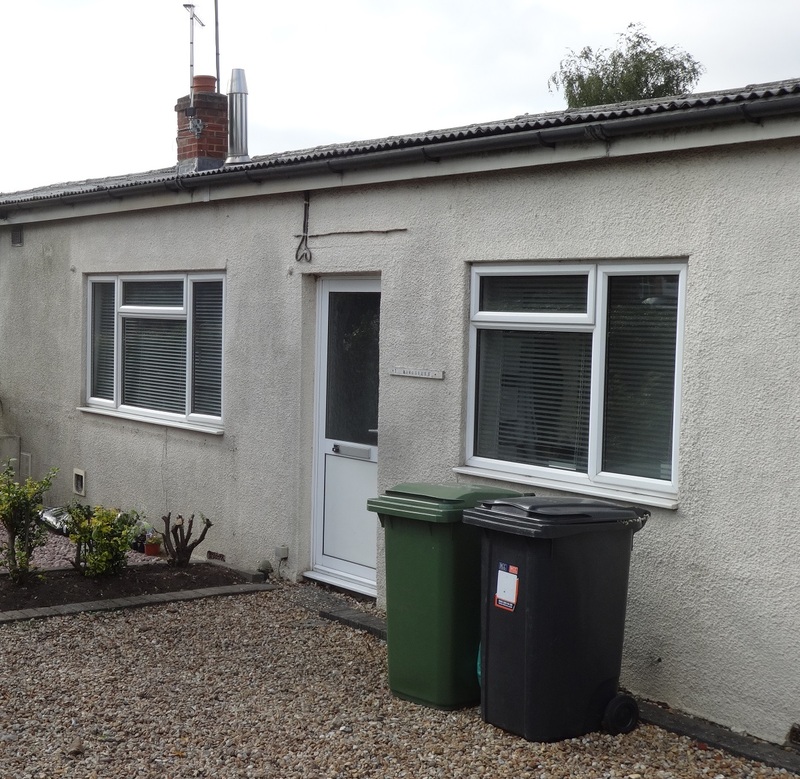 Or maybe your grandmother has memories of working in a different style of job to help the war effort here at home, in WW1?